It’s like when you start painting the kitchen, which turns into a kitchen remodel and you end up gutting half the house. Over the weekend, I was changing fonts, tweaking the logo and generally simplifying my blog, as you can see above. One thing lead to another and I ended up changing my WordPress theme, for an entirely different look. Ever notice there are trends in website design? There are stylistic changes but new technologies also influence how they look and work. 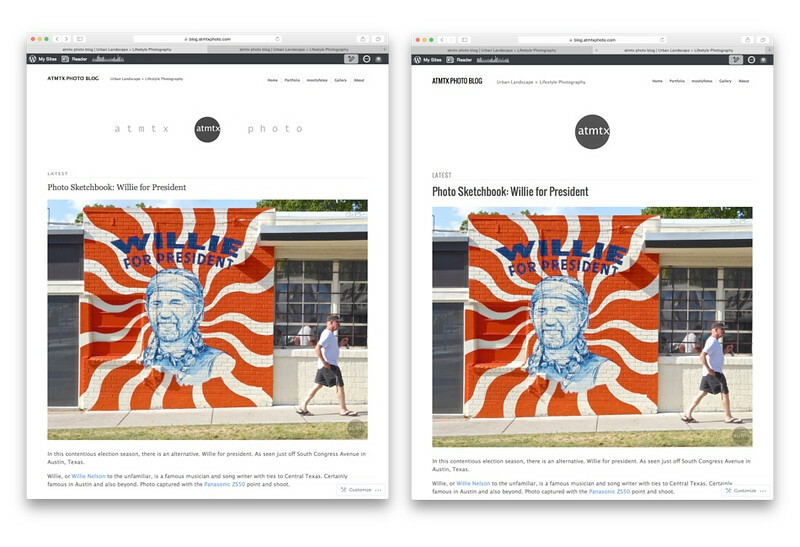 The buzzword, over the last couple of years, is “Responsive Design”. A responsive website dynamically adjusts to the size of screens, which is especially important with the rise of smartphones and tablets. My old blog looked decent on computers, though slightly dated, but it kinda sucked on small mobile devices. This new one seamlessly keeps its look on any size screen. Looking back, the last time I did a major design change was October of 2013. I had a very black, two column look. It was more cluttered back then and the black background and small white text made it harder to read. There are always compromises. There are things I don’t like about this new theme. For example, the size of the photographs are smaller. However, clicking on most photos still brings up a larger version (I didn’t add a larger version on this post). Also, the photos would, at times, unpredictably shift and ruin the nice center justified design. I don’t know if it’s a bug in the CSS or in the browser. Hard to tell these days on the web. I would have preferred a visible menu at the top for my wide-screen PC view, but the ultra clean theme hides it behind the 3 horizontal lines on the top right corner. By the way, in the web world, they call these icons, “hamburgers”. It’s a convention that is becoming popular on new websites, so hopefully, people will be able to use it. And behind that hamburger, I have ambitious plans. Plans that I’ve mulled for years but haven’t done much about. I really need to reorganize my blog. Perhaps this visual transformation will give me the encouragement to tackle the content organization challenges. The biggest visual change is on the front page, where colorful squares, which represent blog posts, dynamically load and reposition themselves. They also look great on smartphones and tablets too. The page is both simpler and more cluttered at the same time. But this being a photoblog, the colorful content beckons more effectively, I think. For years, I’ve been envious of those slick Squarespace powered websites. They just seem to look better and look more professional than WordPress.com. A couple of times a year, I would vaguely contemplate switching to Squarespace but the amount the work was daunting. Not to mention the increased costs, the potential loss of SEO links and losing the WordPress community. This new theme satisfies for now. I hope you like it too.